For all of the howls of protest about David Cameron stoking up “Project Fear”, Brexit campaigners managed their own persistent line in scaremongering in the course of the UK’s referendum campaign on EU membership. 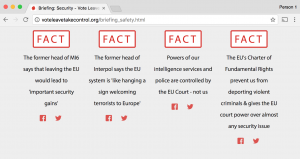 The EU itself, Vote Leave claimed, was a threat to the UK’s national security (see screenshot below). Such claims play fast and loose with the facts; in Abu Hamza’s case the European Court of Human Rights did not impose any extra burden upon the UK in the extradition case; it rejected his argument that his conditions of detention in the United States post-extradition would amount to inhuman and degrading treatment. The argument also elided the European Union with the European Convention on Human Rights, which for now remains unaffected by Brexit (although Theresa May did come close to identifying the ECHR as the real enemy of UK interests during the referendum campaign). These claims also betray a deeper yearning to free the security services of the impact of a meaningful legal oversight framework which did so much, in the context of the Northern Ireland conflict, to highlight human rights abuses by state agents. For commentators like Dearlove, adverse European Court judgments in the course of the conflict undermined public confidence in the security services. More considered commentators acknowledged that the abusive practices themselves undermined public faith in the authorities in Northern Ireland long before any adverse judgments, and that the oversight provided by European institutions was one of the few effective tethers to the concept of “liberal democratic” law enforcement in Northern Ireland. The soon-to-be Prime Minister also lauded the benefits of intelligence sharing and police co-operation achieved under EU auspices. These aspects of EU activity have deeply impacted on policing and security partnerships in Ireland, perhaps in an even more profound and practical way than the process which led to the Good Friday/Belfast Agreement. Ireland first gained a formal say in UK security policy in Northern Ireland through the Anglo-Irish Intergovernmental Conference, established under the Anglo-Irish Agreement of 1985. The Irish Government’s ability to contribute to security policy in Northern Ireland was simultaneously affirmed and put into abeyance by the 1998 Agreement’s provisions for the British-Irish Intergovernmental Conference. Although the concept of the Conference was retained in the Agreement, it was to be sidelined during the operation of the devolved institutions (and as recent weeks have shown, is difficult to operationalise even when the devolved institutions are not functional). These developments were at a policy level. Operational policing and security cooperation across the Irish border was a more difficult ask. Relations between the Gardaí and the RUC were strained by intense criticism of how the conflict in Northern Ireland had been policed (including collusion between elements of the police and Loyalist paramilitaries), by fraught cross-border extradition battles in the 1980s and 1990s, and by allegations of Gardaí collusion in Provisional IRA activity (the most serious of these allegations, regarding the murders of Chief Superintendent Harry Breen and Superintendent Robert Buchanan following a cross-border security conference, being substantiated by the Smithwick Tribunal in 2013). In this context, developments at an EU level have made a dramatic difference. Since it entered force in 2004 the European Arrest Warrant (EAW) has become woven into the fabric of policing cooperation between Ireland and Northern Ireland. Over two thirds of the EAWs sought by the PSNI between 2007 and 2017 involved a request to the Republic of Ireland (113 out of 154 in total). The EAW operates on the basis of a presumption that EU member states maintain equivalent protections for defendants within their criminal justice systems, and as such helps to defuse potential controversy around extradition requests and to reduce the time frames for surrender of suspects from years to weeks. Building on the use of the EAW, the Gardaí and PSNI also built up their relationship through practical cooperation in Europol. The legal instruments surrounding Europol also allow for the cross-border sharing of police intelligence. Policing cooperation built up through these EU mechanisms was then belatedly grafted onto the Northern Ireland peace process in the 2015 Fresh Start Agreement. This established a joint Task Force, operative since early 2016, to enhance cooperation with regard to cross-border crime. Brexit potentially reverses these gains. The UK stands to be locked out of the EAW system and the legal frameworks for enhanced police intelligence sharing provided by the EU. In response, the UK has sought to “grease the wheels” of a trade deal with the EU by “offering” to retain the EAW and policing cooperation. The problem with this line of thinking is that the UK does not gain much leverage by using policing cooperation tools that it is desperately eager to retain (see Theresa May’s 2016 speech above) as a bargaining chip. If the EU is to allow the UK to retain these measures it will be the party to the Brexit negotiations making concessions; EU law will have to be altered to allow a non-member state to share in these elements of cooperation. The fallacy involved in presenting one of the UK Government’s key demands as a bargaining chip illustrates its failure to grasp the realities of Brexit. Although the EU might want to maintain extensive policing and security cooperation with the UK, it has long expressed serious concerns over the UK’s intelligence gathering methods (and particularly with the incompatibility of electronic data collection with the EU’s data protection regime). Brexit could see such a rapid divergence in the UK and EU’s approach to security that no amount of wishful thinking will address the rift. Indeed, it might only be through the intervention of Ireland, the EU member state most directly losing out from any degrading of policing cooperation involving the UK, that these parties can be kept on the same page. Colin Murray is a Senior Lecturer at Newcastle Law School (UK). His work (alongside Sylvia de Mars, Aoife O’Donoghue and Ben Warwick) on the impact of Brexit upon Northern Ireland will be expanded upon in a forthcoming book; Bordering on Two Unions: Brexit and Northern Ireland (Policy Press, August 2018).